Last week on the blog we revealed the third of our updated Season 4 model cards, Granite the Stern Enforcer of the Mason’s Guild. 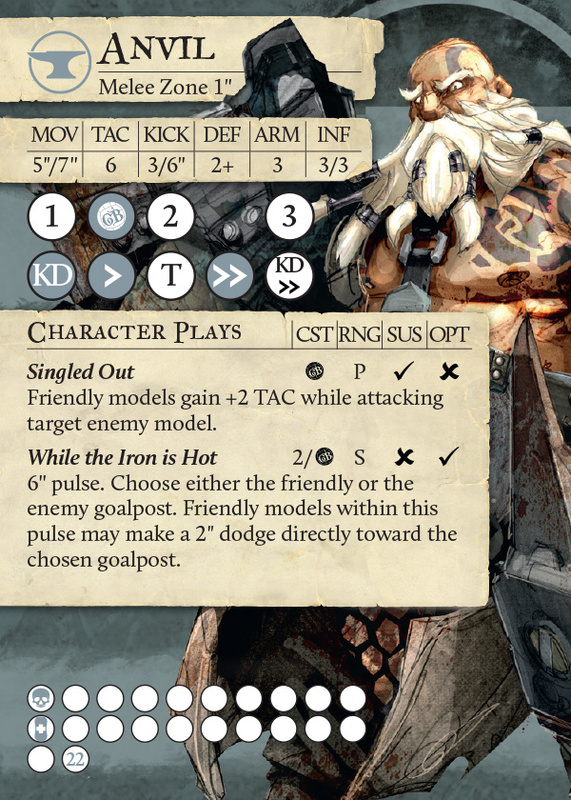 Today we’ll be continuing with our model card reveals with a double bill from the Blacksmith’s Guild featuring Anvil, Noble Patriarch and Sledge, Tempered Steel. As we mentioned on last week’s blog one of the first things we did when we started the development of Season 4 was to take a look at the intended playstyle for every Guild as a whole, and then each model individually. This process helped us to identify not only which models needed to change, but also by how much and with what purpose in mind. These objectives were in addition to overall aims such as reducing complexity and tweaking game balance. The Blacksmiths are a Guild that we wanted to tweak the intended playstyle of, ever so slightly. We’ve been watching how you’ve all been playing with the Blacksmith’s Guild, as well as noting their most played models, since their release at the end of 2017. Quite early on we noticed that generally a more goal scoring heavy playstyle had been favoured overall, regularly featuring pairs like Ferrite & Iron, Farris & Bolt, and Hearth & Alloy. We wanted the Blacksmiths to have a decent amount of goal scoring potential, but their capacity for inflicting take outs was not quite been as strong as we intended it to be. Our aim with the Blacksmiths in Season 4 is to make their potential for inflicting take outs just as good as their potential for scoring goals. The first step in tweaking the Blacksmith’s Guild playstyle was the development of Veteran Cinder, a re-envisioning of how a melee-focused Apprentice Blacksmith stands out from any other kind of melee-focused squaddie in any other Guild. Firstly, it’s important to remember that the Blacksmiths don’t have the fundamental elements that make most take out focussed teams strong, such as a captain that can take 6 influence, inflict massive damage to the enemy team, and generate a stack of MP all in the same activation. The Master Blacksmiths need to put in a lot of set up to get the most damage out of their Apprentices, who often feature incredible playbook damage results that are extremely difficult to reach without help. The trade off is that once an Apprentice Blacksmith has been set up, it’s allowed to be capable of captain-level damage during a single activation. This is where Anvil & Sledge come in. Just after the Blacksmith Guild’s release in Season 3, Anvil & Sledge were quite often the first models to be dropped from a roster. While they embodied what we wanted the pinnacle of the Blacksmith take out game to be, they just weren’t good enough at it. To this extent, we have not changed the intended playstyle of Anvil & Sledge, but we have made them more effective at their intended role to help adjust the overall playstyle of the Blacksmith’s Guild. 2, 4, 6, 8, Who Do We Appreciate? SLEDGE! So lets get into the meat of this, Sledge. In Season 3 he was firstly overshadowed by Iron since it was much easier to get consistent damage output from him, and then by Veteran Cinder because she was the prototype for the new way to make an Apprentice. We took the lessons learned from Sledge’s original development, and that of Veteran Cinder’s, and applied them to Sledge’s Season 4 changes. 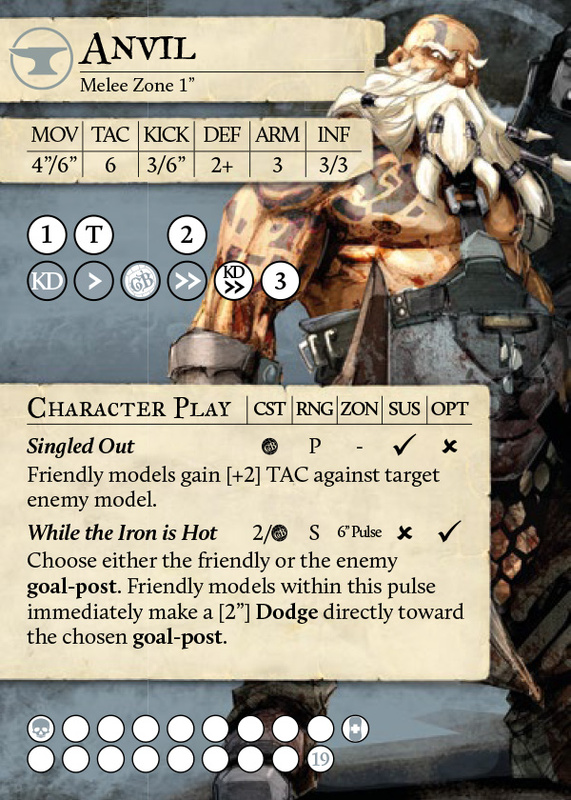 The first thing we did was take another look at Sledge’s intended playstyle, a model who deals massive damage per attack, but doesn’t have as many attacks per turn as someone like Iron or Veteran Cinder. The problem was that Sledge’s attacks were not doing enough damage to make this type of playstyle effective. The answer was that we needed to juice up his playbook damage, hence this section’s title! Each result has been increased by at least 1 damage, and in some cases by 2 damage! This gives Sledge’s attacks an incredible amount of potency and even though damage from someone like Iron may be more consistent, the upper end potential for Sledge’s damage output scales significantly faster than Iron’s. In other words, set up for Sledge will often have a greater effect than the same level of set up for Iron. The only other changes to the front of Sledge’s card were that both his push results moved down by a single column, and he gained a single point of health which gives him a total of 13 hp. The change to Sledge's push playbook results will be explained when we talk about Sledge's character traits. The extra health point better reflects how much fighting we expect Sledge to do whilst keeping him in line with the majority of Apprentice health pools. Anvil’s changes are more numerous, but also more subtle than Sledge’s. For Sledge to get the most out of his playbook, he needs to be marshalled by a Master Blacksmith capable of easily sending Sledge’s damage output into the stratosphere. To this end, more or less everything Anvil does has been made a little more efficient or easier to use. Starting off with his playbook, the two most important results that Anvil has are his momentous knockdown on the first column, and the playbook trigger for his character plays. The latter result has moved down from the third column to the second. This mainly means that Anvil will be able to hit his Singled Out character play pretty easily against most targets, which is an excellent way to increase the damage output of any Apprentice Blacksmith, particularly Sledge. In addition, we extended the traditional Master Blacksmith playbook style to Anvil, making his playbook one lower than his TAC. To help Anvil apply his more efficient playbook, we also increased his MOV stat from 4”/6” to 5”/7”. Not a dramatic increase, but that extra inch when making a jog to go and knock an enemy model down and put Singled Out on it is hugely important. Finally, we also realised that Anvil wasn’t quite as difficult to take out as we thought he should be. Master Blacksmiths are renowned for their resilience, and Anvil should stand out even among the company of his fellows. So we made a simple change and increased Anvil’s number of health points from 19 to 22. For Sledge, we only made one change to the back of his card, but it’s a big one. Knockback has gone and been replaced by a brand-new character trait called Powerful Charge. We did this for a few reasons. Firstly, because Knockback didn’t gel particularly well with what we want Sledge to be about, which if that isn’t clear at this point, is hitting things like a freight train. Knockback is a trait which is more to do with the repositioning of enemy models, and the only way that Sledge wants to reposition models is by putting them on a Physician’s Guild stretcher. This is also why Sledge’s push playbook results were moved down by one column each, they were only as high as they were previously because we had to account for the extra pushes provided by Knockback. One of the other things about Sledge is that when he’s forced into charging, his damage output drops significantly. This is because the opponent will almost always use defensive stance to lower the amount of damage Sledge can cause, and they will also often declare a counter attack. This can force Sledge into having to waste his big charge attack by choosing a knockdown result to prevent the counter attack from ruining his activation. With Powerful Charge, Sledge can instead focus on dealing as much damage as he possibly can, because as long as he hits with his attack the enemy model will suffer a knockdown playbook result in addition to anything else Sledge does. Similar to Sledge, only a single ability changed on the back of Anvil’s card, his legendary play Tested Mettle. Firstly, Tested Mettle no longer grants +1 TAC to Anvil himself. Instead, it gives Anvil Stoic, allowing him to resist being pushed around. 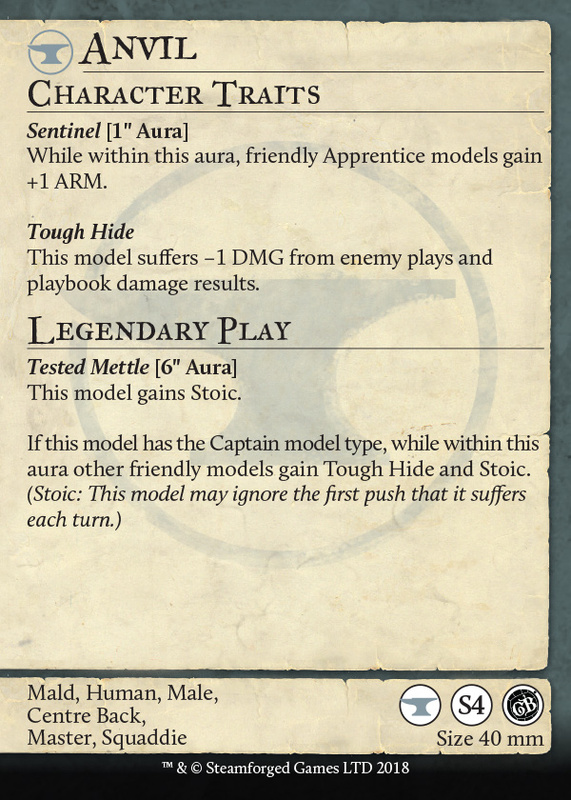 This can be important when Anvil is holding the centre of the pitch and providing valuable ganging up bonuses or shielding nearby Apprentices with Sentinel. Overall it cements Anvil’s role as a tank on the pitch, an immovable object that will take an incredible amount of effort to take out. 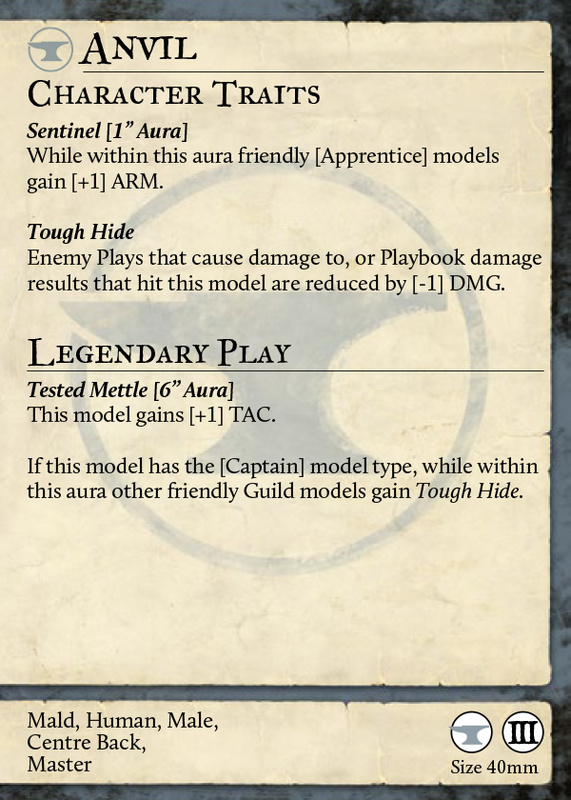 Finally, to give Anvil a stronger bid at being chosen as the team captain, the second part of Tested Mettle now grants friendly models Stoic in addition to Tough Hide. Again, this focuses Anvil’s role as a captain to help his team batten down the hatches and absorb an incredible amount of punishment whilst maintaining their positions on the pitch. That’s all for today folks. We hope you enjoyed today’s double reveal! Join us next time to see the reveal of the new and improved player card for Ploughman, the Honest Labourer of the Farmer’s Guild.